The Crag Crest Poultry Ranch is situated on the sun-drenched south slope of the Grand Mesa in western Colorado. A medley of chickens, heritage turkeys, guinea fowl, geese and ducks make their home here. The ranch’s feathered residents roam free during the day, providing organic pest and weed control to our garden, orchard and vineyard as they feast on bugs, grass and seeds. At night, they sleep in a predator-resistant barn. We raise a variety of poultry, including chickens, guinea fowl, geese and heritage turkeys. See FAQ below. Most turkeys grown commercially have been selectively bred to produce a very large proportion of breast meat and to grow as quickly as possible. These traits are good for the grower, but not so good for the bird. The broad-breasted turkey varieties raised commercially can no longer reproduce naturally and they quickly develop skeletal problems, because their legs cannot easily support their large chests. Many cannot walk naturally. Heritage turkeys, by contrast, are more like their wild brethren. Heritage turkeys breed through natural mating, they have a long reproductive lifespan, thrive in outdoor environments, and maintain a slow growth rate, to allow their skeletal muscles and organs to support their muscle mass. We raise a medley of heritage turkeys– Black, Bronze, Narragansett, Midget Whites, Slate, and Bourbon Reds. These breeds are listed in the American Poultry Association’s Standard of Perfection and in Slow Food USA’s Arc of Taste. Why should I buy a heritage turkey? They taste better. Heritage turkeys beat Butterballs by a huge margin in a blind taste test conducted in 2008 at Ayrshire Farm in Virginia (and reported by Mother Earth News). By purchasing this heritage turkey, you’re helping to keep these old-time turkey breeds alive and to maintain genetic diversity in the poultry world. You’re also helping to support community-based agriculture and a family farm. We appreciate your support! Why does it matter that my turkey was pasture-raised? We allow our turkeys to live like wild birds. 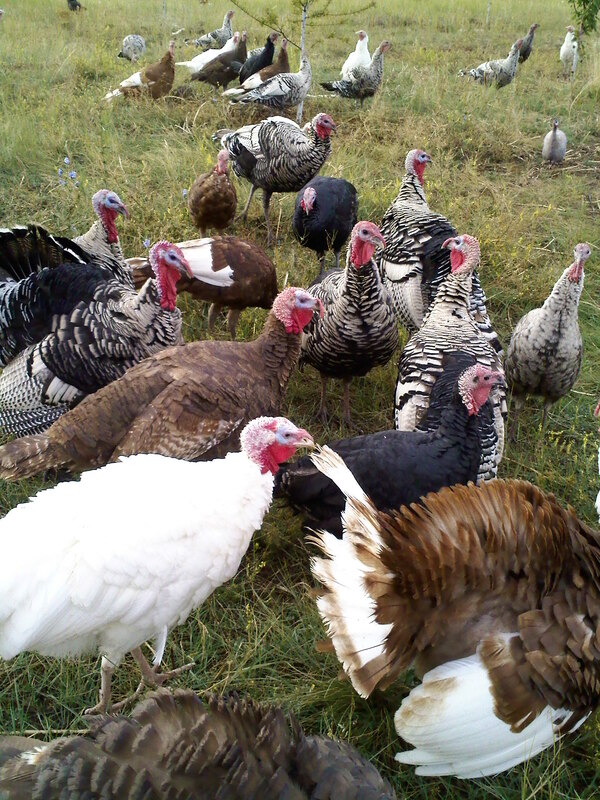 All our turkeys have free access throughout the day to pinyon forest, orchard and vineyard land. This “free-range” lifestyle affords them a more enriching, healthy life than what they’d experience in a traditional poultry operation, but it also boosts the production of our farm by reducing the number of pests like grasshoppers and keeping the grass in our orchard well-mowed. Studies suggest that pastured poultry are leaner than conventionally-raised birds and pasturing also seems to boost the proportion of heart-healthy omgea-3 fatty acids in the meat. Our turkeys are never given antibiotics or hormones and they are raised on organic feed, along with pinyon nuts, bugs, seeds, grasses and other wild foods they forage around our farm. Because we are a small-scale farm, we have chosen not to pay for the certification process, but we will happily answer any of your questions about how we raise our birds.